Almost one in four Irish consumers now do their shopping in either Aldi or Lidl, according to figures to be published. The new figures from retail analysts Kantar Worldpanel, seen by The Irish Times, show that in the 12 weeks up to April 24th, Lidl commanded an 11.2% share of the Republic’s grocery market, while Aldi had a share of 10.9%, taking their combined total over a three-month period to 22.1%. Based on these figures, the German discounters’ share of the Republic’s grocery spend is now within touching distance of market leader Supervalu, which has a share of 23%. Their combined reach puts them virtually on a par with Tesco, which saw 22.2% of Irish grocery shoppers come through its doors over the last three months, and sees them leapfrog Dunnes Stores, currently on 21.5%. By comparison, Kantar figures issued last month, compiled using old methods and based on a significantly smaller number of sample shoppers, gave Supervalu 24.95 of the market, with Tesco in second on 23.9%, 0.4% ahead of Dunnes Stores in third. 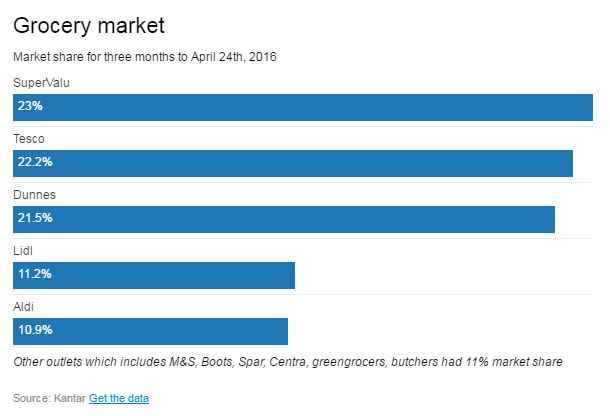 Those figures put Lidl and Aldi at 8.5% and 8.4% market share respectively, a total of 16.9%. The phenomenal success of the German discounters in recent years can better be seen by comparing their new figures with those of six years ago. In 2010, Aldi had a total market share of just 3.2%, while Lidl had a share of 5.6%. While the new figures indicate a dramatic shift in market share since the last Kantar figures were published four weeks ago, they do not reflect any change in spending habits over the period. Kantar Worldpanel said the changes are explained by a significant recalibration of how it collects its data. It uses a panel of shoppers to assess market share and said that it had now widened its panel to 5,000 shoppers - an increase of 70% - in order to paint a more accurate picture of the Irish grocery market.